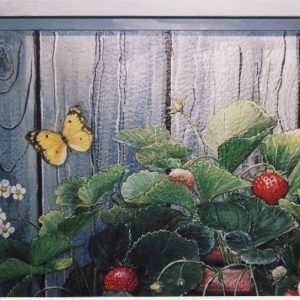 This mural with a Trompe L’oeil wood surface is painted on the porch of my own home. 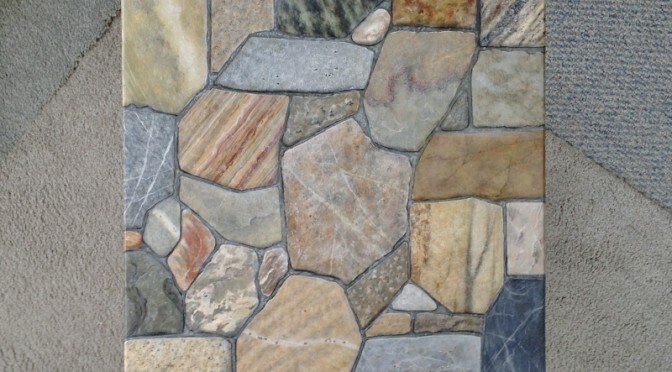 For more than 25 years these walls were just a slightly textured, ugly brown, metal surface. 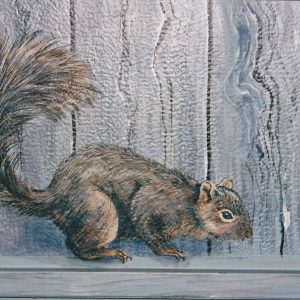 Then ten years ago I decided to paint it! 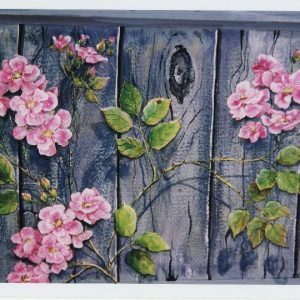 Thank you to my sister-in-law for suggesting the faux barn board wood surface. 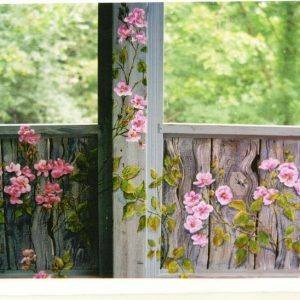 On the wall which is viewed directly from inside my dining room, I painted rambling wild Roses that ‘bloom’ all year long! 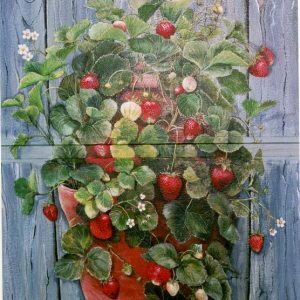 On one of the sides I created a strawberry jar loaded with luscious berries. 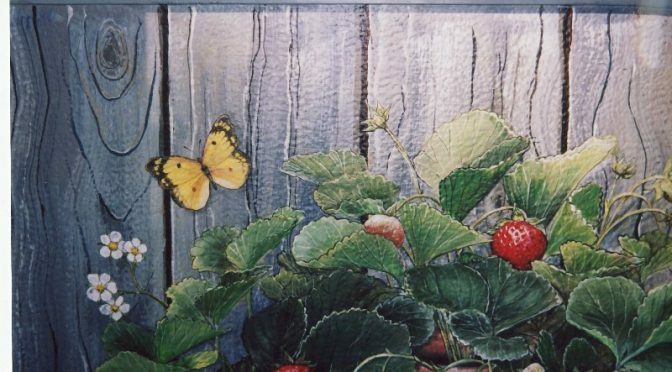 There are bees that visit the flowers and a butterfly by the strawberries. 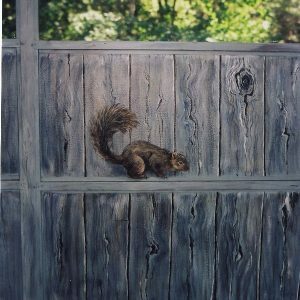 On the other side is a squirrel which initially even startled my cats. 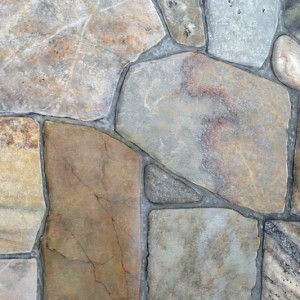 They have ignored it ever since! 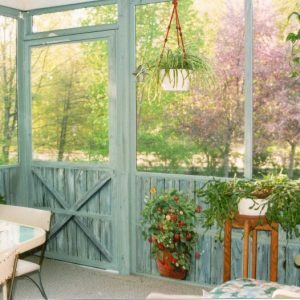 In the winter I hang baskets of artificial green plants to keep a little summertime always just on the other side of the sliding door. 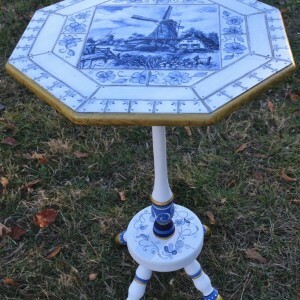 This table is painted to appear as if the top is inlaid with a variety of stone tiles fitted together like an old crazy quilt. 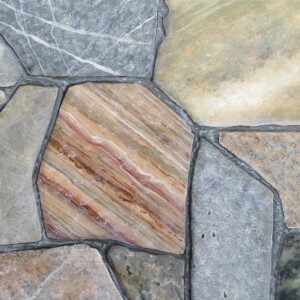 The lower shelf is painted as a single slab of Marble. 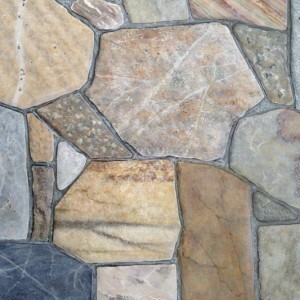 All of the faux “stones” are based on actual stone found in nature. 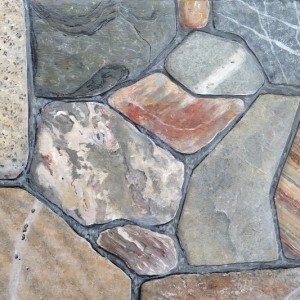 Subtle colors of grey, camel and gold were chosen for the legs from frequently used colors in the stones. 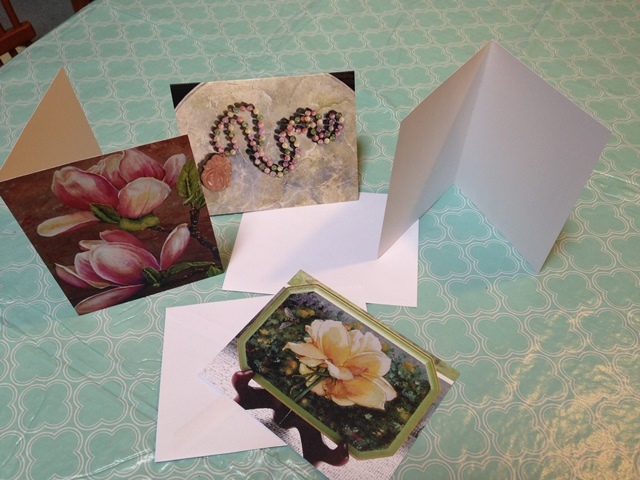 The table top is 16″ square, the lower shelf is 12″ square. 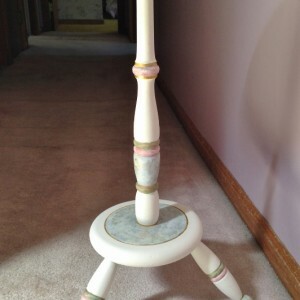 The table stands 27.5″ tall. 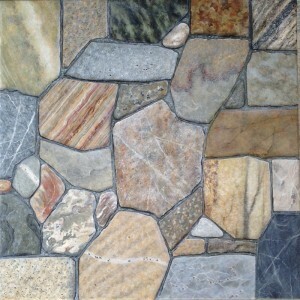 It is available for sale at $180 plus shipping. 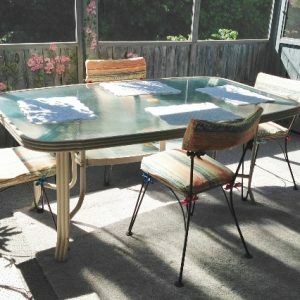 This little wooden table has been transformed. 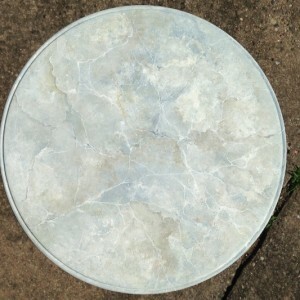 The faux marble surface is painted in a range of soft greys on the 14″ round top. 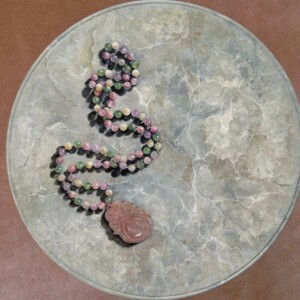 A bead necklace of pale green, lavender and pink quartz with a lotus motif pendant is painted in Trompe l’oeil style. 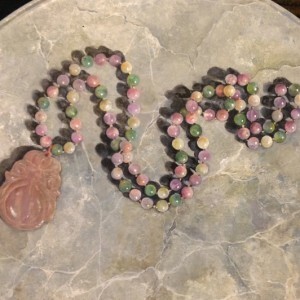 The necklace looks real enough to pick up and wear! 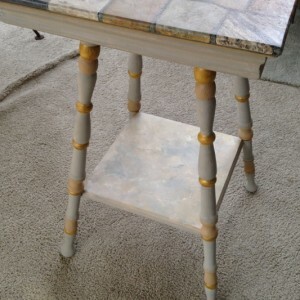 Of course the marble illusion is painted on the underside too! 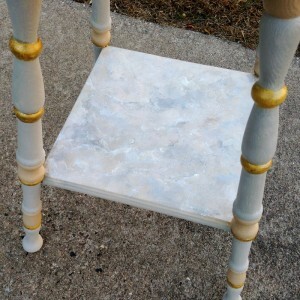 I kept the colors on the pedestal soft and a little mottled, and paired them with creamy off white and just a little bit of gold banding. 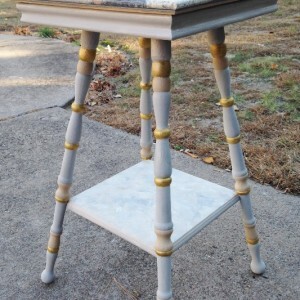 The table stands 25″ tall and weighs 5.5 pounds. 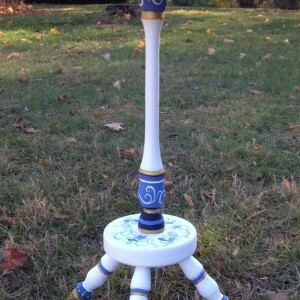 $150.00 plus shipping and handling. 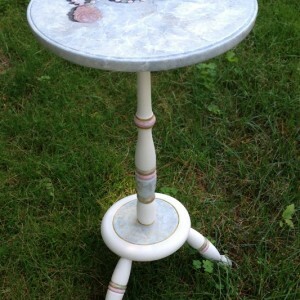 Please contact me if you are interested in purchasing this table. 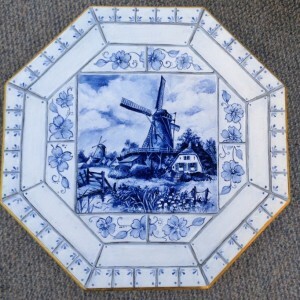 I painted this graceful pedestal table so that it would appear as if it was covered with real blue and white Delft tiles. 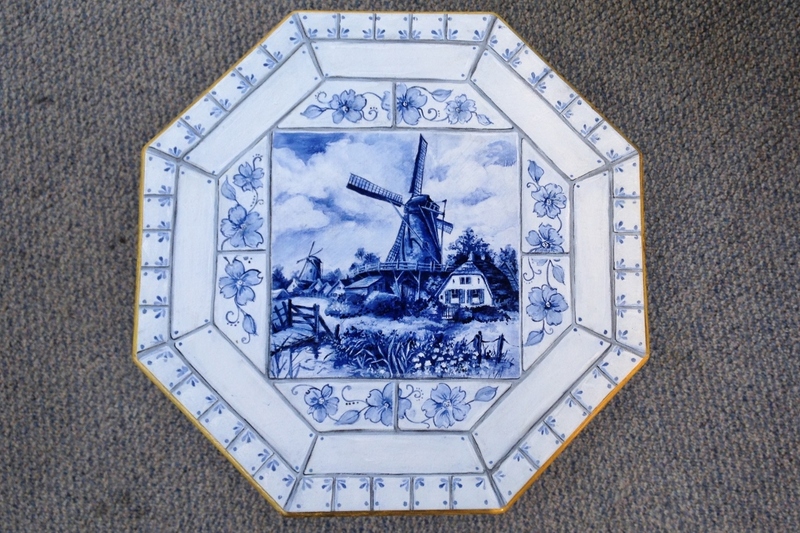 The inspiration for the center classic windmill scene was an old delft plate and the border tile designs, and the pedestal motifs, are loosely based on real tiles which I found in my research. 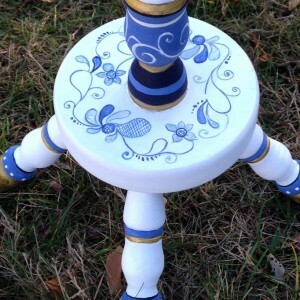 All the varying shades of blue and ‘gold’ leaf are are carried into the table base and legs as well. 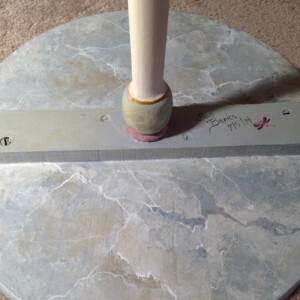 The table is 24″ tall and the top is 14″ across. 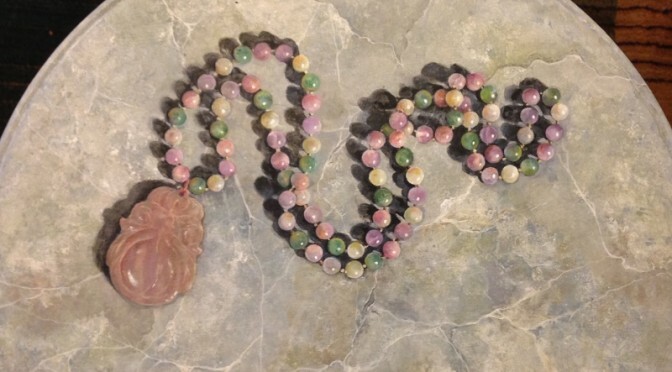 If you are interested in possibly commissioning a similar piece or you want to know more about this piece Send me an email or leave a comment.